Perfect for groups of up to 25 people, this beautiful Fountaine Pajot catamaran is sure to please. 40 feet of pure pleasure, this baby is loaded with 4 cabins, 2 restrooms, a small kitchen and a gas grill. She is excellent for sunset cruises too, watching the colors reflect off the clear Cancun Caribbean waters while sipping cocktails from the always open bar. Make a day of it by sailing in beautiful Cancun or wander off to the tiny island of Isla Mujeres. Explore the town on foot or rent a golf cart, enjoy a buffet lunch, snorkel on various coral reefs or just bask in the sun with a drink in hand, feeling the wind in your hair and stopping every so often for a dip in the warm Caribbean waters of Cancun. 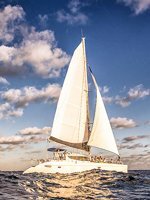 This catamaran offers a whole range of itineraries to suit your group and give you an unforgettable sailing experience. Whether you are looking for a romantic dinner cruise, a luxurious wine and tapas evening, or a full day of sailing fun in the Caribbean! If you're staying in the Riviera Maya or Playa del Carmen, we can offer you transportation to Cancun so you don't have to miss out on all of the fun! From $1400.00 $1195.00 SAVE 15% ! From $1220.00 $975.00 SAVE 20% ! YOUR SUNSET CRUISE INCLUDES THE FOLLOWING TAPAS! Boat: 40' Sailing Catamaran for up to 25 people. We have bigger catamarans too, all the way up to 100 people, and also smaller ones for smaller groups! Departs: Complimentary Pick-up is Available at Marina Hacienda del Mar in Puerto Juarez, Marina Las Perlas in the Cancun Hotel Zone and La Amada Marina in Playa Mujeres. Guests can add round-trip transportation from Cancun hotels when booking for $12.00 per person round-trip. Transportation from the Riviera Maya and Playa del Carmen is available upon request for an additional cost. Duration: Available for 3, 4 or 6 Hour Tours. Extra Hours available at additional cost. Extra Cash for Tips or other Optional Items.